I posted these gluten-free chocolate dipped cookies over on the Better Homes and Gardens blog yesterday. When they asked if I’d be interested in making one of their recipes gluten-free, I instantly knew I wanted to make something chocolatey for Valentine’s Day. I think I usually post holiday specific recipes just a few days before the actual holiday but this year, I’m prepared. 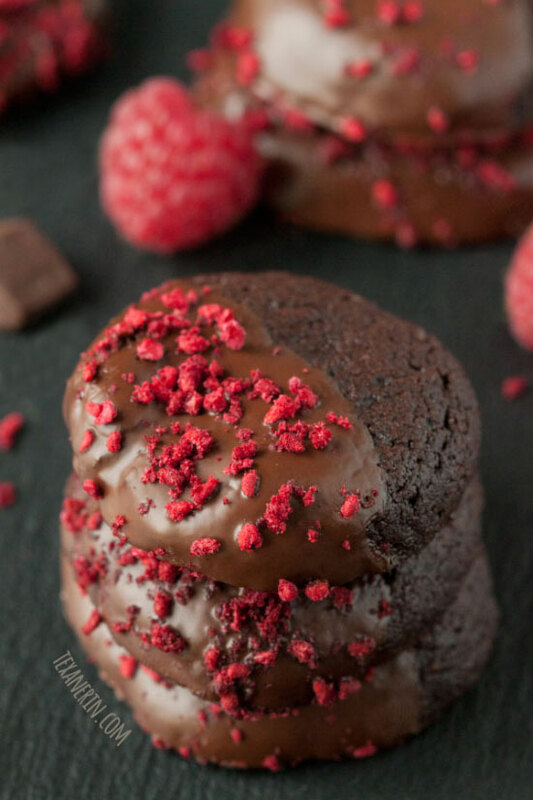 I have chocolate raspberry recipes galore! The recipe I adapted from BHG uses all-purpose flour, brown sugar, and the usual cookie ingredients. I made a whole bunch of changes! The result? They’re grain-free, gluten-free, dairy-free, paleo-friendly and 100% whole grain! You can see the changes I made here. When I first started using buckwheat, which is actually a pseudograin, I hated it. Haaated it. But I’m so in love with using it in chocolate treats! It’s so easy to sub in for all-purpose and whole wheat flour (at least in the few things I’ve tried). If you don’t have buckwheat on hand, you can use whole wheat for a version that’s not gluten-free. The original recipe calls for dipping the cookies in chocolate ganache, which I’m sure is delicious, but since I wanted to keep things dairy-free, I just melted a little coconut oil with some chocolate. It tasted just as good as ganache to me! After dipping the cookies in chocolate, they tasted great but looked a little lacking in festiveness so I added some freeze-dried raspberries to the chocolate part. Not to gloat or anything but isn’t that the best food coloring / sugar-free decoration?! The berries are so vibrant. And they actually add to the taste, unlike sprinkles. I thought for some reason that the berries may get soggy but that definitely wasn’t a problem. To check out my post, click on over here! 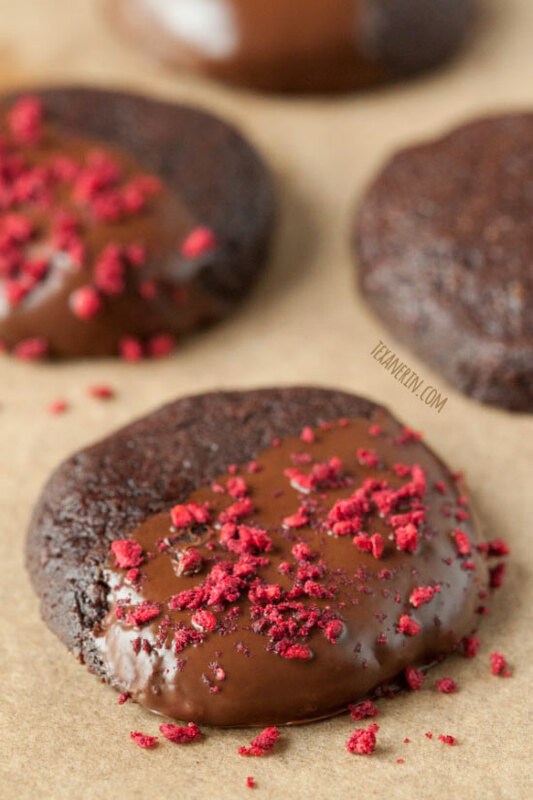 30 comments on “Chocolate Dipped Cookies (grain-free, dairy-free, whole grain)” — Add one! mmmmm chocolate raspberry recipes would make my mom super happy haha! She loves that combo! Might have to make these for her! I’ve never baked with buckwheat flour- this looks delightful! This recipe could get me into big trouble because I love those cookies!! And they’re so gorgeous! Love that your working with buckwheat flour, and it can make so many things an ugly color if you don’t have the cocoa to mask it. These came out beautiful! What a great idea to melt coconut oil with the chocolate to replace ganache! These are some of the prettiest Valentine’s treats I’ve seen! So sorry I didn’t see your nice comment until now! Thanks so much for the kind words. :) Hope you had a nice Valentine’s Day filled with chocolaty treats! I ALWAYS have buckwheat flour on hand and while I can see it not being great in all recipes, I bet the sweet chocolate pairs with the nutty buckwheat really well. Such festive V-Day cookies! Freeze dried berries are so great for a pop of natural, vibrant color! And oh my goodness, these cookies sound amazing. I have to make a batch for my mama, she’d be so happy! Hi, I’d love to try these. I’m curious why you hated buckwheat when you first tried it. I’ve never tried it, but I don’t want to go buy it if I’m going to hate it too. Is it a texture or taste thing? just wondering. Hi, Karen! Thanks so much. :) The texture is fine – it’s the taste! It honestly tastes like dirt. I’ve tried heavily spiced treats like carrot cake, spice cake, pumpkin stuff, etc. but I could always taste the buckwheat (and it was so bad that I threw it all away). But in chocolate treats, you can’t taste it at all! I’ve never noticed any strange taste in anything chocolate flavored (meaning cocoa powder or melted chocolate in the dough / batter, not just chocolate chips). This is just me, though. A lot of people really enjoy the taste and even use it in pancakes and other treats. I think it’s a bit of an acquired taste. You could also use all-purpose, whole wheat or maybe even an all-purpose gluten-free baking mix if you don’t want to buy buckwheat. 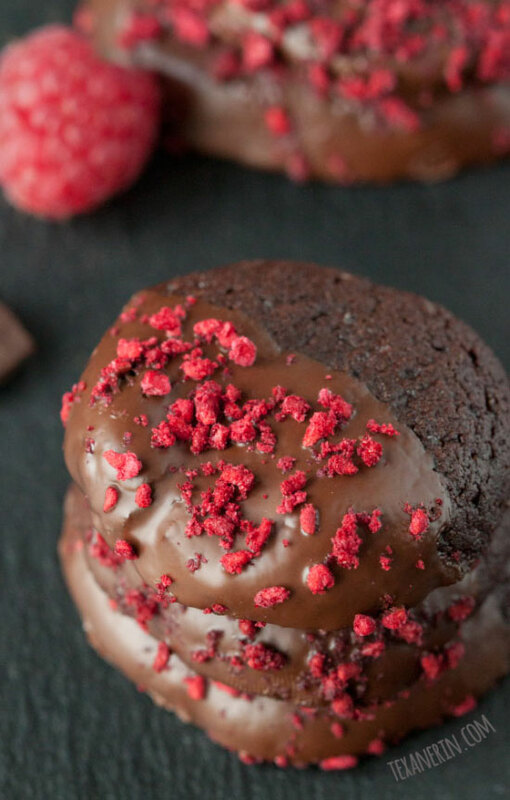 Love this healthier chocolate cookie – but those raspberries – what gorgeous color! Yep! Those freeze dried raspberries are the perfect replacement for sprinkles this time of year! Fun cookie! I LOVE the freeze dried raspberries on these! They look perfect.